Sen. Romney addresses Davis County constituents at his first official town hall as a senator. More than 250 Utahns packed into several rooms in the Davis County Administration Building in Farmington to hear Romney speak. The county, Romney noted, voted for him by the highest margin in the general election. Despite the friendly territory, many of his new constituents demanded answers from the freshman senator about why portions of the government have gone unfunded and federal employees are still working without pay. “In my opinion, it is wrong for people to be told, ‘You have to show up to work, but we’re not paying you.’ That’s simply wrong,” Romney said, adding that he would support legislation proposed by Sen. Ron Johnson, R-Wis., to pay federal employees who are required to work without pay during future shutdowns. Romney said the Senate would vote Thursday on two proposals to reopen the government, but he couldn’t predict whether either would succeed or not. One proposal includes money for Trump’s border wall, while the other, approved by the Democratic-controlled House, would fund the government while negotiations over border security continue. Romney supports a barrier along the southern border but repeatedly lamented the fact that American citizens are paying the price for a disagreement over border security. Romney speaks with a constituent after his town hall in Farmington. Another constituent posed a question about why Romney voted to ease sanctions against companies tied to a Russian oligarch and Putin ally, Oleg Deripaska. Romney called Deripaska a “bad guy” but said he voted with other Republicans to ease restrictions on his companies after he agreed to give up majority ownership. However, a New York Times report this week finds that Deripaska, under the terms of the Treasury Department, is likely to benefit from the deal. 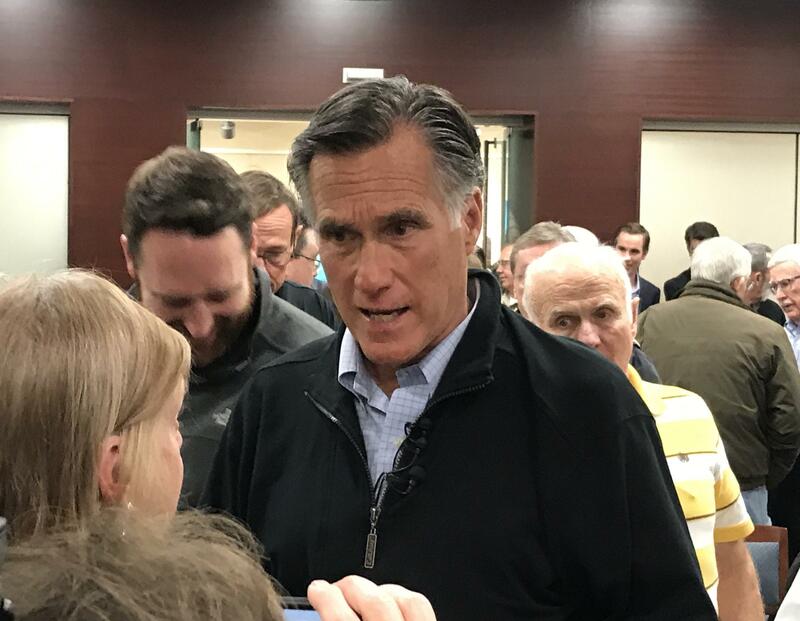 Ogden resident Pam Harrison was hoping to ask Romney whether he would support lowering marijuana from a Schedule I drug as more states including Utah move toward legalizing cannabis for medicinal use. She didn’t get the chance to ask a question, but Harrison said she had another reason to attend: supporting the thousands of federal workers who work in her community. Carla Caldwell, a Trump supporter, said she attended the town hall because she was upset by Romney’s recent op-ed questioning the President’s moral character. She said she felt better after hearing Romney speak at the meeting.